Contents: 3 Canisters and 3 Bags Order today to remove boat odors and marine odors! Boats typically are filled with powerful odors such as bilge odors, mold and mildew odors, fuel odors, head and holding tank odors, galley odors, smoke odors and pet odors. Earth Care will eliminate all these odors. In the past boat owners have had to use caustic chemicals, expensive detailing, air purifiers and caustic ozone machines to rid their boat of odors. Earth Care Odor Remover Bags can simply be hung in your boat and they will completely eliminate all boat odors. Earth Care draws in odors like a powerful magnet. The odors are absorbed, and neutralized without any fragrances. It is made from an all natural mineral, is non toxic and biodegradable and safe for Planet Earth. It is also safe around children and pets. It does not have to come into contact with odor producer to eliminate the odor. Earth Care does not cover up odors it literally "clears the air" leaving the air fresh and clean. Hang one bag in each bilge compartment, the head, the galley, the forward cabin and aft cabins or where odors are strongest. Some air circulation such as an open hatch is needed. Do not put bag directly in standing water or direct sun. 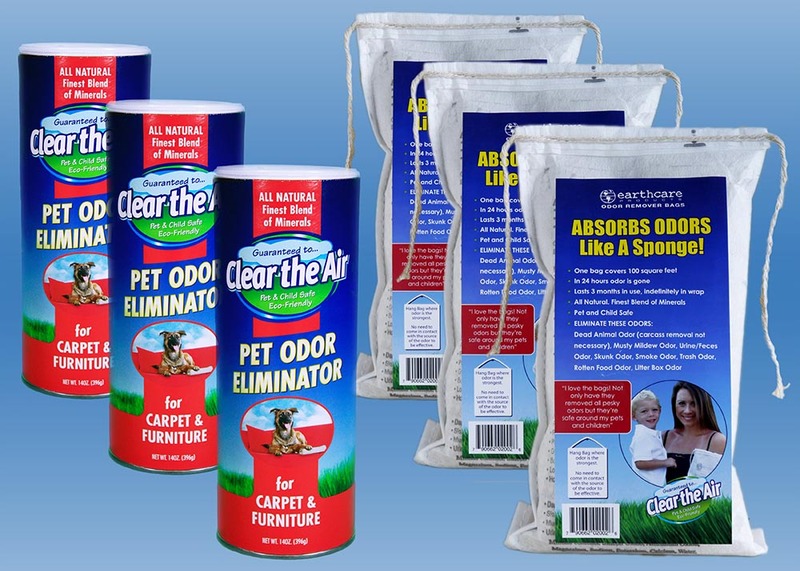 The bags will continue to eliminate new odors for up to 3 months. Each bag will cover approximately 100 square feet. 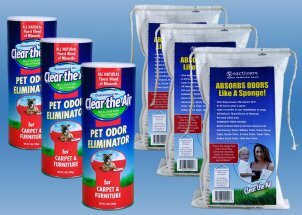 Sprinkle all 3 cans of Clear The Air Odor Eliminator for Carpets and Furniture on all upholstery and carpet. Leave down 24 hours and vacuum or sweep up. All odors are typically eliminated in 24 hours. Click Here to learn more about boat odor removal.